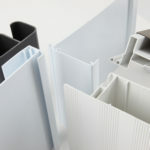 BESPOKE CUSTOMER DESIGNED EXTRUDED PROFILES. PAL Extrusions offer design assistance and encourage involvement between the company and clients, from concept to reality, in order to develop a successful profile. Using considerable production expertise and investment in CAD technology and modern plant they are now leading the way in the development of rigid & flexible profiles for a variety of new markets. These include Caravans & Motor homes; Automotive & commercial vehicles, Shop fitting, Kitchens & Partitioning .